It can often seem as if film composers hide in their studios, so that though we know their work, the person behind the pencil is less known. 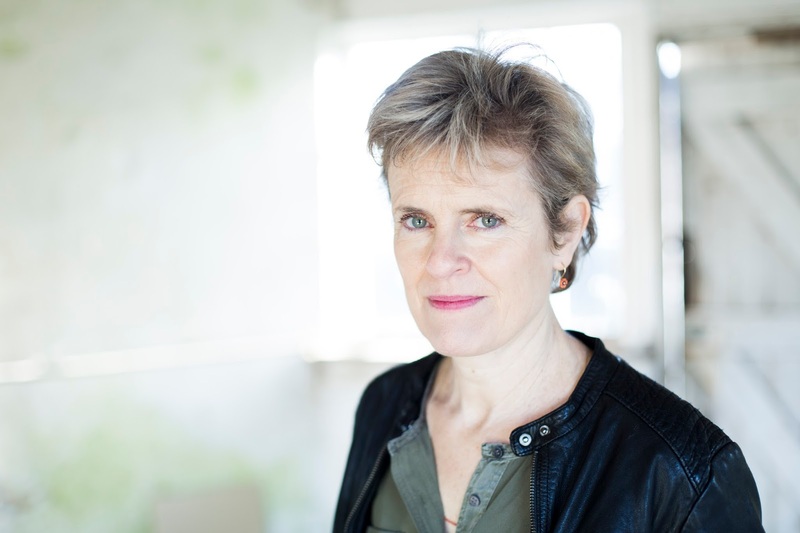 The composer Rachel Portman wrote the score to the TV series Oranges are not the only fruit and she has gone on to write scores for such films as Cider house rules, and Chocolat. She was the first female composer to win an Academy Award in the category of Best Musical or Comedy Score (for Emma in 1996). 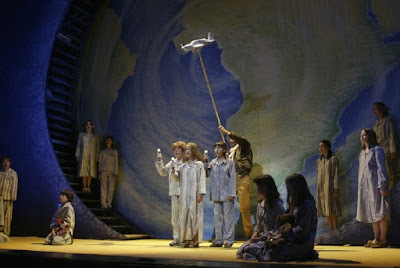 Her opera The Little Prince was premiered by Houston Grand Opera in 2003, and her choral work, The Water Diviner's Tale was premiered at the BBC Proms in 2007. I was lucky enough that Rachel had time between deadlines to meet up to chat about her career in music, and to talk about her most recent project, writing the score for Marks & Spencer's 2016 Christmas advert. In fact, our wide ranging discussion covered many aspects of writing for film, not to mention Rachel's love of writing opera and her surprisingly traditional attitude to her craft. I met Rachel at her London home and we chatted over tea in her basement studio; a delightful conversation about films, music and much besides. She was happy to talk about the craft involved in writing film music, and perhaps a little surprised that someone should take so much interest in it. Projects like the Marks & Spencer Christmas ad are indeed a big deal, essentially it is a complete film in miniature. Rachel's challenge was to create a satisfying piece of music whilst supporting the drama and all in the space of a few minutes (there are in fact long and short versions of the advert). In the longer one there is time for each of the main themes to be repeated just once. Whilst she used themes for individuals and events, she comments that did not want to point up every piece of the drama, adding that this isn't Tom and Jerry. Being more like a mini-feature film than a commercial, her work was highly considered. She is very traditional in the way she creates music, she writes using pencil and paper and writes slowly. She writes the sounds that she hears in her head, using just a piano rather than anything more complex. For the Marks & Spencer ad what appealed to her was the little boy, and within ten minutes she had the boy's theme. It is up to her how she tells the story in music and as the character was a child she chose a simple theme. (In fact if you watch the ad, the main theme only really gets going when the little boy appears, all the rest is in the nature of a prelude.) 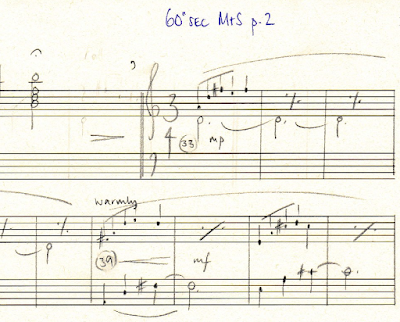 After her piano version, the next stage was for Rachel to produce a short score and someone created a synthesised version from this. This version of the film, with synthesised score, was then subject to an amazing amount of critical discussion from the director and others involve in the advert. 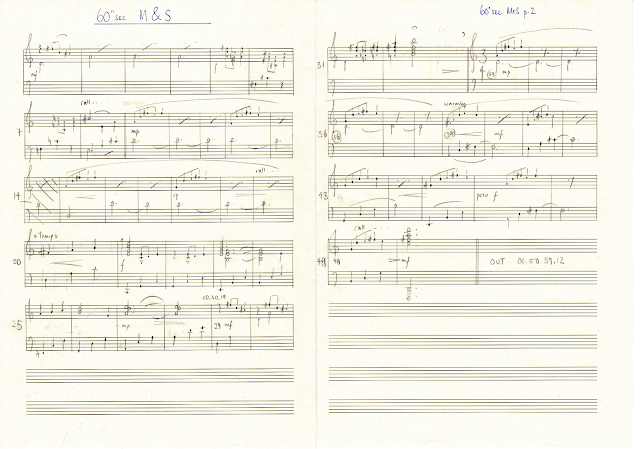 The final version had a fully scored orchestration production, and this was then recorded live at Abbey Road Studios. For a full-length feature film, Rachel needs to plot out where in the film music is to go. The Marks & Spencer ad was unusual in having music from beginning to end. Rachel often writes themes for characters or events in films, she likes working melodically and though not every film requires this approach, she feels that you can sell an emotion better using a melody. Rachel started off by simply wanting to be a composer, and she wrote a lot whilst at school. She studied music at the University of Oxford, with Robert Sherlaw Johnson, and she describes the music she was writing at the time as a mixture of the eccentric, influences included Stravinsky, Satie and John Cage, and she adds that she loved Stravinsky's Pulcinella. But under Robert Sherlaw Johnson she was encouraged to write atonal music, and this rather dissuaded her from showing her work to him. She felt discouraged. Whilst at Oxford she started writing for the theatre, and was lucky that a film was made with undergraduates (Privileged). It was the first of its kind, and featured Hugh Grant (he and Rachel were contemporaries at Oxford), and Rachel wrote the music for the film. When she left university she decided that film was more exciting than theatre, the scene changes were quicker! She spent her 20s trying to break into film. She was lucky that Channel 4 was just starting and she did a lot of TV drama (including Oranges are not the only fruit). Channel 4 built on the British tradition of high quality drama on television and the first two television films she worked on were released in the cinema. During this period she essentially learned on the job, and never had any formal training in film music. She counts herself very fortunate to find out that she likes story-telling in music, in any shape or size whether film, theatre, opera or TV advert. She feels that she is there to extract something from the film; the film (or text, or story or theatre script) is her master. She admits that this is not an intellectual way of writing, it is something more visceral. She feels she is known for her period drama and comedy (not, she adds Hollywood eccentric comedy), such as Oranges are not the only fruit or Benny and Joon. She does not feel that her style is entirely romantic, the music has an edge, making it bitter sweet. Whilst working she likes to vary what she does and having written her children's opera The Little Prince, (premiered in Houston in 2003 and subsequent performances include London, Lithuania and San Francisco) she has another in the planning stage, and hopes it comes to fruition. She enjoys setting text and cannot do this in film. As well as The Little Prince, she wrote an oratorio about climate change, The Water Diviner's Tale, with Owen Sheers (poet, and author of the novel I saw a man) which was premiered at the Proms. She describes the performance as fantastic, with massed youth choirs, and a chamber choir of 40 teenagers (Hertfordshire County Youth Choir, Berkshire Maestros Youth Choir, Bromley Youth Choir plus members of the National Youth Choir of Great Britain, Chantage and Taplow Youth Choir, with the BBC Concert Orchestra conducted by David Charles Abell). Projects like this enable her to step out of the film world and to keep finding new things, to keep expanding. When I mention the subject of sexism in what was (and still is) a very masculine industry, Rachel admits that she never noticed any. Partly she attributes this to having grown up in a very masculine environment. In her sixth form she went to a former boys school where there were hardly any girls, and she was in the first cohort of girls to be taken by Worcester College. So she never even thought about it. But she admits that there were a few raised eyebrows, people who thought they were terribly brave in giving her a job. She went for one job, writing music for a masculine film, and she was asked whether she felt up to writing music full of testosterone, whereas she simply saw it as a challenge, just as a man is capable of writing something feminine. She adds that she had great fun making the music for the film full of masculine energy. When we talk about the music's life away from the film, she feels that film music today has a significant independent life. Music is a lot more accessible nowadays with services like Spotify, so a lot of people listen to film music away from the films and she meets people who have all of her music. Her scores for Cider House Rules and Never Let Me Go are played often, though she adds that she is not sure whether the music should have a life independent of the film. She also likes developing her own projects away from film, which enables her to take more control, and she also feels that it is important to have live performances. These pieces require writing in another way, and she wishes to do more concert music, adding that film deadlines can be very stressful. To relieve stress she takes a good walk, and her advice to a young composer in a similar situation is to keep at it and do not think that the music isn't working. In film, each project is a different story, and each film will have its own problems (or not). Films come about with so many people coming together, and then the film is refined in the editing process till it is at its best and though to be working, or not. She usually comes in at the end of this process, during the last three months. The actual process depends on whether the film is working or not. If it isn't working then there are more voices to listen to and her score will come under more scrutiny, with many people commenting, and there will be test screenings which can lead to comments like 'the music needs to be funnier'. This means that a smaller budget film can be wonderful to work on because there is just the director to work with, rather than being dragged through the whole preview process. She cites as an example of this, the film this summer, Their Finest which was set in London during the Blitz, directed by Lone Scherfig and she describes it as a very good film, and a joy to work on. When she writes she already knows what the orchestration will be and would take her ideas from what she feels the story needs. In her opera, The Little Prince she used a lot of oboe as she heard it as his voice. But in films she often has to sell her ideas to people who are not musical, who are not comfortable letting you do something without having the score mocked up, and she finds it a bit deadening having to keep redoing the demo rather than getting on with the real orchestration. But a director like Roman Polanski,who is confident in his own musical choices and who has directed opera, left it up to her when she worked on his film Oliver Twist. Unfortunately nowadays there is always a temp score used during the editing process, and they cannot do a test screening without a temp score, and this can adversely affected how the sound develops as far as the composer is concerned. Film makers are also blinded by the sounds easily accessible in synthesizers, and feel that a composer can create a score in five minutes. But Rachel is interested in creating something bespoke, and doing it herself. She also isn't interested in having a team writing for her. She does use electronics, and might use and ambient layer to which she would add instruments. Rachel a real advocate of less is more when it comes to music in films. She feels we are drowned in music, there is far too much out there. Things can be more immediate without music, and a scene can be very powerful in the moment that the music comes away. Whilst she enjoys writing for film, her desert island project would be to create another opera. She found the process of writing The Little Prince exactly like writing a film. She immersed herself in the book, went to the desert, slept out under the stars and listened to the sounds of the desert. She loved working with the librettist, the playwright Nick Wright. In fact she loved the whole process, finding it rather like writing a novel, and she hugely enjoyed the rehearsal period. 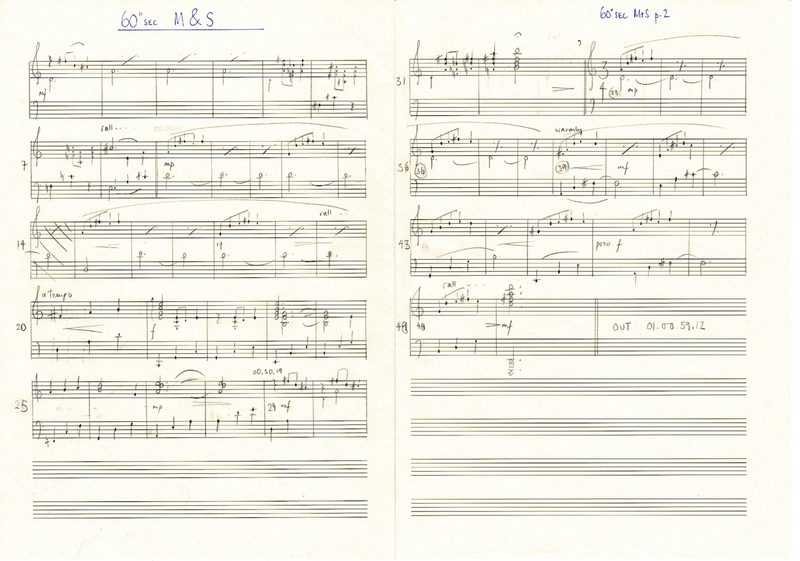 The full score was lovingly hand-written by Rachel, something that is impossible in the pressured environment of modern film making. When she wrote the score for Benny and Joon (her first feature film in Los Angeles in 1993) she wrote the score in three weeks, orchestrating it by hand, it then went to a copyist and was recorded. 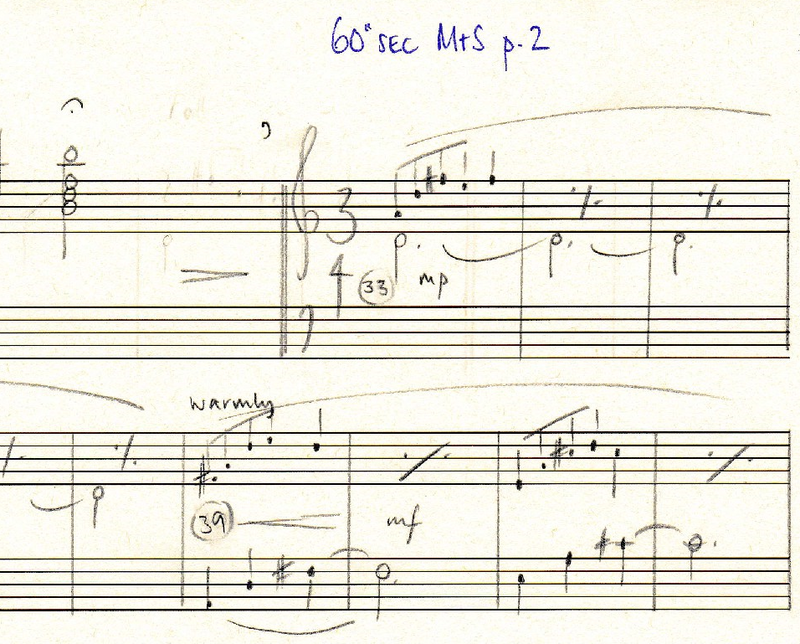 Nowadays there is no time, and her short score goes straight to an orchestrator. even though she oversees it, and specifies a lot, she thinks it would be wonderful to do the orchestration too. It is this -involvement with the whole detail of her craft which makes Rachel long to do another opera. With Love - Rachel Portman's score for the Marks & Spencer Christmas advert on iTunes.